Working on the lineart of this...!!!! Preorder the first issue of The Orville now! 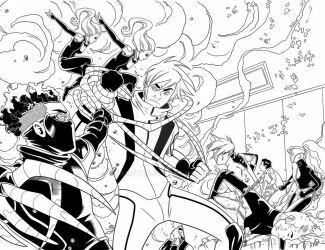 Working on the next 4 pages of The Orville #3. Difficult again, too much perspective! 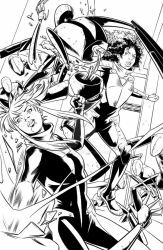 Working on the first 4 pages of The Orville issue #3. They're difficult! A lot of pageviews in the last 2 days... Don't know why, I have posted no new images! 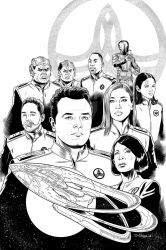 Finally received the script for issue 3 of The Orville. Starting to figure out how to layout this new book! Waiting for issue 3's script of The Orville to start the second story. Amazing night at the Film Symphony Orchestra Show yesterday, playing John Williams OST of several movies, completing an amazing birthday! Intense moment when they played Star Wars music! Superb issue 18 on sale today! And Superb vol. 4 inks finished! One page left to ink and I'll finish vol.4 of Superb! One of my inking videos was retweeted yesterday by Gail Simone and Ray-Anthony Height! By the way, you can see all my inking Superb videos on my instagram (kashinorei). 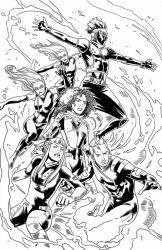 Half of Superb's 19 inks done! 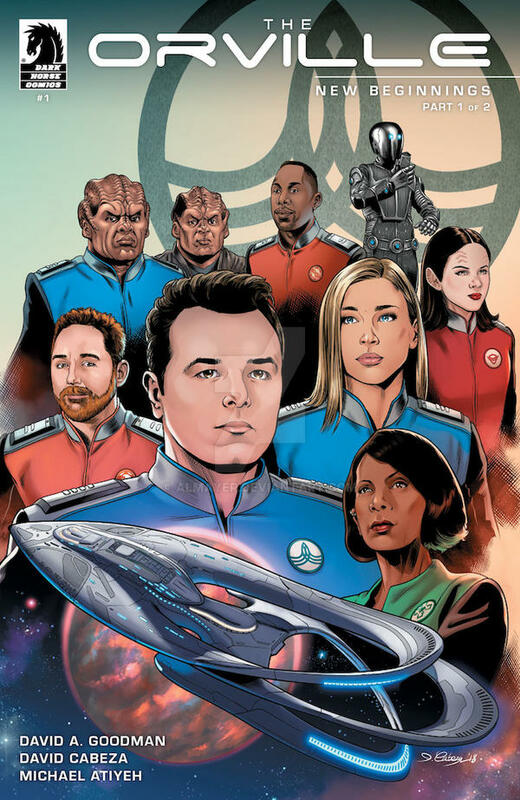 Well, the cat is out of the bag at last: The comic miniseries I'm working on for Dark Horse is Seth MacFarlane's THE ORVILLE! 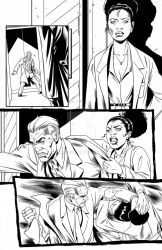 8 inked pages to finish the second issue of my job for Dark Horse! 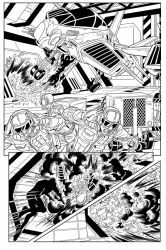 Starting inks of Superb's issue 19, the final one of this arc (vol. 4). 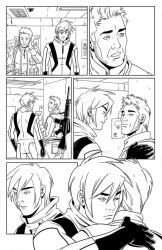 Inking the first 7 pages of the second issue is hard! A lot of details! All the pencils from Dark Horse's issue 2 approved! Now inking! Do you now Superb 17 is in stores now? Get your copy! I guess I'll be revising them but the last four penciled pages has been sent... Crossing fingers! I studied Fine Arts in Seville, my hometown, majored in painting. I've been working as a graphic and web designer, illustrator and cartoonist for a small local company. 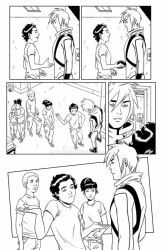 Now I'm a freelance, working for Lion Forge as an inker and Dark Horse as an artist. I said that when I was working for the American market, when I had achieved my first objective, I would write a journal to assess how I had achieved it, how long it had taken me, what efforts I had made, etc. 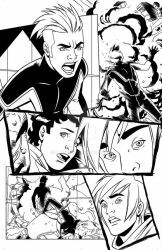 Well, I've been inking for a few months now for that market and my first opportunity to draw my own pages has come up, so I think it's a good time to write this. It's been more than 2 years since I decided to try it. 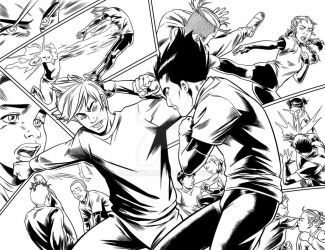 My first intention was to be an inker, even knowing that it is a profession that sooner or later will become extinct. 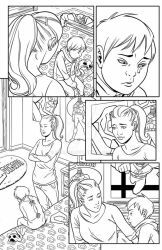 A few months later a friend who was already working for the USA asked why I was not trying to be a lineart artist (pencils+inks) instead of only an inker. That made me change my plans, making them more ambitious, but also more difficult to make! The first year was quite strange, unemployed as it was and making only some samples that took too long to finish. If something was decisive at that time was to participate in penciljack.com forums and be lucky to be reviewed by Paul Smith in several of my samples. No doubt he helped me learn a lot about all aspects of comic book industry, especially storytelling. I'm really grateful to him! But if there has been something that has meant a before and after has been to contact an agent. When I was accepted, I promised to deliver at least 6 pages of samples every month so that he could move them through the publishers. And the result came relatively fast: the first month I had a positive response, nothing less than DC, although they later lost interest (and I do not blame them, as I was, and I still am, green for such a large publisher), but it was very exciting. 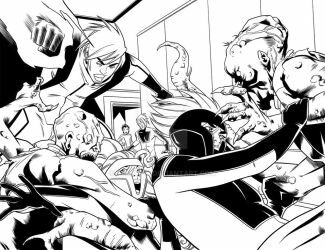 Soon Valiant, Aftershock and Lion Forge also responded to my agent's emails, without much enthusiasm, but they did. 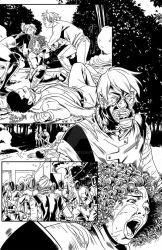 Lion Forge gave me my first opportunity, the inks of a complete issue. I finished those 24 pages in 9 days! I enjoyed it a lot and I was really motivated, like never before. 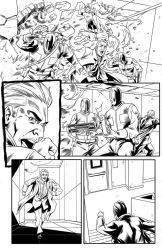 Then came a fill-in of inks of the same series, which started being 6 pages and in the end were 15, offering me also to complete the arc with some more issues! 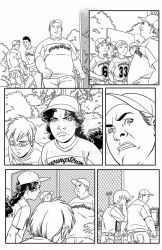 Then came two tests: draw some pages for two different projects, one from the UK and the other from the USA (the latter quite important). I was between 4 candidates for the position for the UK project and 5 for the USA's. It was very difficult to get the job, but I had to try. First, I did the USA project, which test script came in much earlier. I delivered the pages a couple of days before the deadline. I did not draw the other test: I got the American project! A miniseries for Dark Horse! I still can't believe it! Well, with all this reading I just want to show a couple of things: 1) Having an agent speeds things up a lot, and 2) Luck also plays a role in the process. The latter could be the subject of discussion. In fact, with whom I mention it, they always tells me that I deserve the job because of my talent and effort. But, I don't think I've tried harder or less than other artists who are trying to achieve the same goals, nor do I have a lot of talent (if I compare myself with the real comic book artists out there). So, as they always say, you have to be in the right place at the right time, no doubt. But if something I have to recommend to people who are starting is to find a good agent as soon as possible. If you have enough quality to start rolling, they will accept working with you, which will be a great injection of motivation, and that will result in improvement in your work, because you will draw more and because the agent, if is good, will guide you and will correct faults. Finally, and although it may still be a bit early, because I still have a lot to prove (this has only just begun), I can say that it is true that dreams are fulfilled. But, beware! You have to work very hard! I'll continue my updates in the timeline, let's see if I'm done for the job! MY pleasure! I hope yours was a fun one! Feliz Cumpleanos to you this Friday David mi amigo and may it be EPIC SWEET! Thx for the watch and favourites! You're welcome, and sorry for the delay answering! Have a spectacular birthday! !